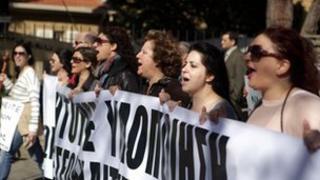 The cost of the bailout for Cyprus has increased to 23bn euros ($30bn; £19.5bn), according to a draft document prepared by the country's creditors. The original cost of the bailout was put at 17.5bn euros. But the new total, disclosed in a document seen by news agencies, means Cyprus will have to find 13bn euros to secure 10bn euros from the European Union and the IMF. Previously it was thought that Cyprus would have to raise 7.5bn euros. Government spokesman Christos Stylianides said: "It's a fact the memorandum of November talked about 17.5bn (euros) in financing needs. And it has emerged this figure has become 23bn. "Who is responsible for this? How did we get here? It was the fear of responsibility and indecision of the previous government," he added. Analysts are now questioning if Cyprus can raise such a sum. Eurozone officials patted themselves on the back last month as it seemed that Cyprus had been rescued. The bailout was approved: Cyprus would raise around 7bn euros itself, and its creditors would cough up about 10bn. Then reality set in as a botched deal began to unravel. The recession will be far deeper, requiring greater government spending on benefits. And troubled banks might need further recapitalisation. So Cyprus must dig deeper. That will crush large savers at the Bank of Cyprus, who face a potential loss of up to 60% to cover the shortfall. But one government MP told me that a worse recession might require more austerity, which could then deepen the recession still, locking Cyprus into a vicious circle. And that may prompt a second bailout. Serious questions remain over this island's survival in the single currency. The winding up of one Cypriot bank, Popular, and the writing-off of a large portion of secured debt and uninsured deposits in the largest bank, Bank of Cyprus, should raise a total of 10.6bn euros. There have also been reports that Cyprus may sell a large portion of its gold reserves in order to raise another 400m euros. "The sheer size of the increase has underlined the extent of the enormous challenges facing Cyprus itself,'' said Jonathan Loynes of Capital Economics in an analyst note. The Cypriot economy is only worth about 18bn euros and accounts for less than 0.2% of the eurozone total. Several analysts now think the Cypriot economy may shrink by more than 10% this year alone. "If everything goes according to plan, the growth figures might at least be in a realistic range, if too optimistic,'' said Christoph Weil of Germany's Commerzbank. "If there are any problems, and there are significant downside risks, then it could be much worse, and a combined contraction of 20% is within the range of the possible." Eurozone and EU finance ministers will meet in Dublin on Friday in a bid to finalise the Cyprus bailout. They will also consider extending debt repayment dates for Portugal and Ireland. But the meeting comes amid fresh concerns about the economic impact of political deadlock in Italy, and speculation about whether Slovenia might need a bailout. Cyprus's future: Is euro membership viable?